My Two Cents Worth (Before Inflation): Who Deserves a Quality Life? The fifteen dollar minimum wage: over the last month pundits on every side of the economic icosahedron have put forth their arguments, couched in terms of effects on job creation, inflationary pressures, global competition and the like. It’s either great, terrible, probably okay or not. I’m a number geek so the numbers side of things is interesting to me, BUT all the economic back-and-forths miss the real question: Who deserves a quality life? Keep that in mind as we look at the general pros and cons of a minimum wage. Most economists agree that establishing a minimum wage decreases the number of jobs that economy produces. Well, no kidding. If we had no minimum wage and paid less than any other country in the world, we could have all the jobs we wanted—assuming people would take them. So let’s get real. We have a minimum wage now and we’re not going to abolish it. The only real argument is about the level of the minimum wage. Minor changes to the minimum wage have not had the deleterious effect to jobs that opponents have suggested. That means a bit of an increase can be had with little economic dislocation. As evidenced by the current lack of jobs, decreasing the minimum wage by letting inflation wear away its real economic value hasn’t produced a plethora of new jobs either. A little change is not what is needed. Measured against inflation, the minimum wage is considerably less than it was when I graduated from high school in 1968. 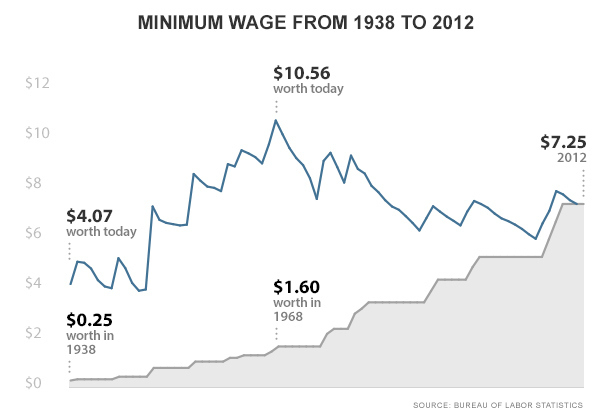 To get back to the same real value as the 1968 minimum wage would require us to increase today’s $7.25 by almost 50%. But that’s not enough. Why should I, and why should you, be willing to pay someone so little they cannot live decently? Assuming you have a job that pays decent wages, imagine with me what it must be like to try to live on $15,000 a year. With rounding, that’s the result of working forty hours a week, fifty-two weeks a year at the minimum wage. Also imagine you have one child to support. You have no benefits, other that perhaps a 401(k) plan you can’t possibly afford to contribute to in order to earn the company match and the opportunity to purchase a family medical plan, for maybe a third of your income—not likely. In the U.S. this level of income for a family of two is just below the published poverty line. It is well below the impoverished line. Some unions are calling for a $15 minimum living wage. At that level, a full-time job will earn $31,200. That’s not exactly rolling in money, but it is closer to the amount needed to take care of basic necessities including healthcare. Others have gone to great lengths to try to figure what a living wage means. I’ll rely on the results posted on http://livingwage.mit.edu/ . Half the year I live in Chatham County, Georgia (Savannah area). According to this calculator, the living wage for an adult and child, the adult working a 40-hour week, is $18.30. That is 22% above the level demanded by the $15 minimum wage proponents. Imagine how far away from a living wage $15 would be for this hypothetical family of two in New York City or San Francisco. Okay, I know some of you are mentally griping about my single parent family. Let’s look at a family of two parents, both of whom work at minimum wage, and two children. As reported by the folks at MIT the poverty level wage is $10.60, and the living wage is $18.82—higher than for a single parent with one child. Okay, I convinced you and everyone else and, we’ve increased our minimum wage to a living wage. What are the consequences of that action? Overnight millions of families will be more economically secure. The money we pay these workers will be recycled back into the economy because although these workers are now being paid up to twice as much as they used to earn, they will not be saving much of this money. It will be used to purchase living necessities. The psychological health of affected families will certainly improve. Government programs to support the working poor will be less needed. Bad news will arrive as well. All economists agree that with such a dramatic increase in wage rates, we will surely lose jobs—and many proclaim that is the reason for not making such a change. Heck, we lost a lot of jobs when we abolished slavery too. We abolished slavery because it was the right thing to do. Counting jobs lost is a mathematical argument. Economists disagree on how many fewer. There will be increased costs for things that currently utilize “cheap” labor. Food crops will cost more to harvest. Fast food will be more expensive. The list is long. By not paying people fair, living wages we hide the true cost of the items and services their labor produces. The extra costs show up elsewhere: in the Earned Income Credit, in emergency room costs when people without insurance get routine care, in higher medical expenses because people cannot afford relatively inexpensive preventative care, and as a society we collectively pay for expensive restorative care. We cannot use the fear of higher unemployment to argue against treating people fairly. A significant portion of our long-term unemployment problem (as opposed to that caused by the most recent recession) is caused by the very poverty a living wage would diminish. Despite the fact that paying living wages will not solve all our economic problems, it is morally the right thing to do.